Does your family love the Museum? Consider purchasing a membership which will let you bring them as your guests for free! Memberships also make great gifts. Purchase a gift membership for someone you love, and they can start visiting the Museum immediately. Please note: all memberships are non-transferable and non-refundable. Four (4) free admissions daily to Kohl Children’s Museum for you and your guests. Two (2) named cardholders on the account for free (yourself, and a spouse, nanny, grandparent, or any other adult). At least one named cardholder must be present to trigger the free admission benefits. Photo ID may be required for admission. For a typical family of four, membership pays for itself by the third visit. Need another cardholder or need to make changes to your cardholders mid-term? Up to 2 additional named cardholders can be added online for $25 each, and receive all admission benefits associated with your membership. Once two cardholders have been named, the $25 fee will also apply to make any changes to named cardholders. Six (6) free admissions daily to Kohl Children’s Museum for you and your guests. Member-only hours every Monday-Saturday 9 a.m. to 9:30 a.m. Membership also delivers discounts at many local retailers and restaurants, including some right around the corner at the Glen Town Center. Click here for the full list of retailers and discounts. How to access your new Kohl Children’s Museum eMembership Card! First, call (847) 832-6600 or stop by the front desk to get your membership number. Then, follow these easy steps to download and activate the free app! 6) View all the benefits of your membership on the app! Corporate membership is a great way to show your employees how you value and promote work/life balance. We will help you find the corporate membership package that fits your employees best and showcase your encouragement for them to spend quality, active, creative play-time with their families in a vibrant, educational environment. Contact us at (847) 832-6914 to learn more about the exciting opportunities that await your valued workforce with corporate membership. Check an entire family off your shopping list! If you're searching for the perfect gifts for families with young children, look no further than Kohl Children's Museum! 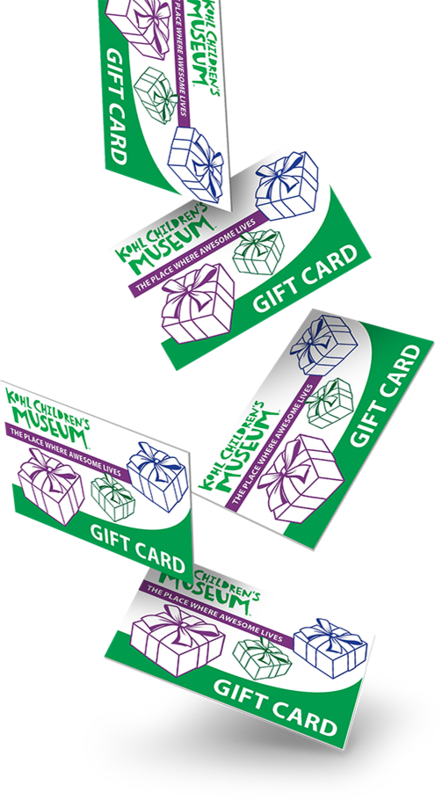 Purchase tickets, a family day pass, a membership, or an entire birthday party — let us help you to create your custom Kohl Children's Museum gift! Call (847) 832-6900 for more information! Please note, we are currently unable to sell gift cards online. You may purchase a gift membership for friends or family, which will begin immediately, using the membership purchase links above.